In this app note we will show you how to perform bass management with the nanoAVR and the nanoAVR_BM bass management plugin. 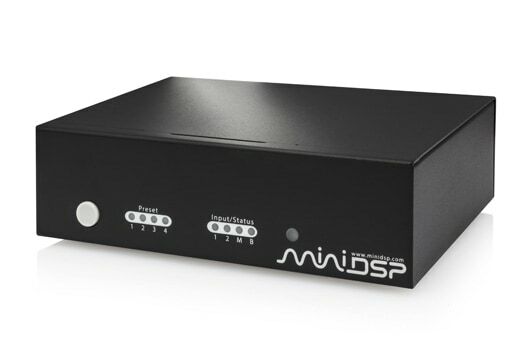 Before starting on this app note, you will need to have connected the nanoAVR into your system and equalized each output channel following the app note Equalizing your home theater system with the nanoAVR and UMIK-1. When movies are mixed for the cinema, each speaker is specified as a full bandwidth channel—that is, 20 Hz to 20 kHz. In practice, a bandwidth of 40 Hz to 18 kHz for the speakers is considered acceptable in cinema and the mixing studio (see the paper "Recommendations For Surround Sound Production"). The Low Frequency Effects (LFE) channel is used for additional low-frequency content. It contains rumbles, booms, and the like, and is fed to dedicated subwoofers in order to avoid overloading the speakers with high-energy low-frequency content. In a typical home theater, some or all of the speakers are not capable of reproducing frequencies down to 40 Hz, let alone 20 Hz. Even if using hifi speakers with a specified low frequency roll off of 40 Hz, they may not be capable of producing this frequency at the volumes required for home theater. The solution is bass management, where low frequencies are filtered out from the speaker channels and instead are sent to the subwoofer. The figure below provides an overview of how bass management is implemented with the nanoAVR and the nanoAVR_BM plugin. At the top in the blue highlight, the seven speaker channels are high pass filtered to remove low frequencies from the signal sent to the speakers. In the green highlight, the signal from the speaker channels is low pass filtered and then summed with the LFE signal. The sum of the LFE channel and the low-frequency content from the speaker channels is sent on to the subwoofer. There is a twist: the LFE channel on the disc is recorded 10 dB lower than the other channels to avoid overloading the recording medium. When we mix the LFE channel with content from the speaker channels, we therefore have to adjust either one or the other by 10 dB to ensure that the mix is correct. In the recommended approach given in this app note, the level of all speaker channels into the subwoofer mix is reduced by 10 dB. Combined with measurement and equalization, a much more accurate system! The starting point for setting up bass management is a set of equalized output channels (with down-mixing if necessary), as described in Equalizing your home theater system with the nanoAVR and UMIK-1. If it's been a while since you did that, you may like to run those measurements again. (In particular, check that you have your subwoofer gain set correctly, so that the LFE channel measures 10 dB higher than the speaker channels.) Otherwise, you're all set to go! Now we will set the crossovers between the subwoofer and the speakers. Click on the LPF block for the front left speaker and link this channel to the front right channel (it's best to start assuming that both channels will have the same crossover frequency). If neither of the above apply, pick the closest. This is only a starting point and will most likely need adjustment based on measurement anyway. With SUB Out muted, to see the response of only the front left speaker. With FL Out muted, to see the response of only the subwoofer. With neither muted, to see the complete response of the front left channel. With the front left speaker done, measure the front right speaker (HDMI Channel 2). Because of the different location in the room, you may not get as good a response with this channel—if not, make some further adjustments to get the best compromise between both channels. If necessary, you can unlink the channels and set different crossover frequencies or slopes. With the front left and right channels done, you can proceed to set up crossovers and repeat the measurements and adjustments for the center channel and the surround channels. The flexibility of the nanoAVR's bass management feature gives you almost infinite control over your signal processing. Above we showed an example with an 80 Hz crossover. Here are some additional notes to help you get the best from your system. While it's recommended that corresponding left and right channels have the same high pass frequency and slope, different sets of speakers may benefit from different crossover frequencies. For example, your surround speakers may need a higher crossover frequency than your front speakers. You can use a mix of bass-managed channels with channels that do not have bass management. If some of your speakers are large enough with sufficiently deep bass response, simply click on the level setting box on the LFE Mgt screen to turn off mixing of those channels. Although the LFE channel on the soundtrack should already be filtered at a frequency no higher than 120 Hz (see "Recommendations For Surround Sound Production"), this is not always true in practice. To ensure that any high frequency content that may be present on this channel is removed, set a Butterworth low pass filter on the Sub In channel at 120 Hz, with a slope of 24 dB/octave or greater. You can see that the left and center channels from the disc now have a very flat response down to low frequencies, thanks to bass management! The LFE channel is 10 dB higher, as it should be. You can now proceed to listen to the system and adjust and fine-tune your settings accordingly. Remember, it's really all about how the system sounds to you. Have fun! Recommendations For Surround Sound Production (PDF), The Recording Academy's Producers & Engineers Wing.